I'll find places for everything, but it'll just take a little time. Meanwhile, what joy to look around and see our coisinhas, our little things that make a condo a home!...Scott and a flamingo lamp! 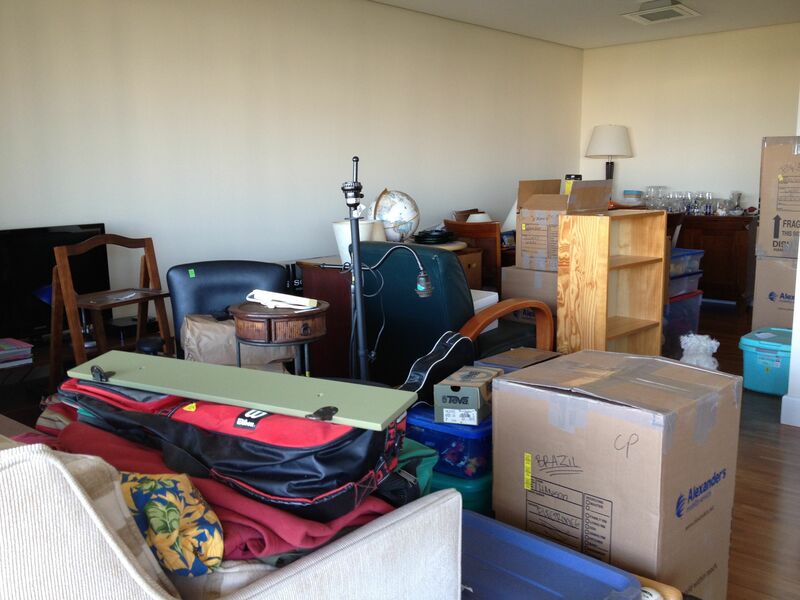 Last weekend was a banner weekend: Scott arrived and we got our worldly possessions after nine months. When we got here three months ago (yes, it has been three months as of today), it seemed to me that it would take forever until Scott came. 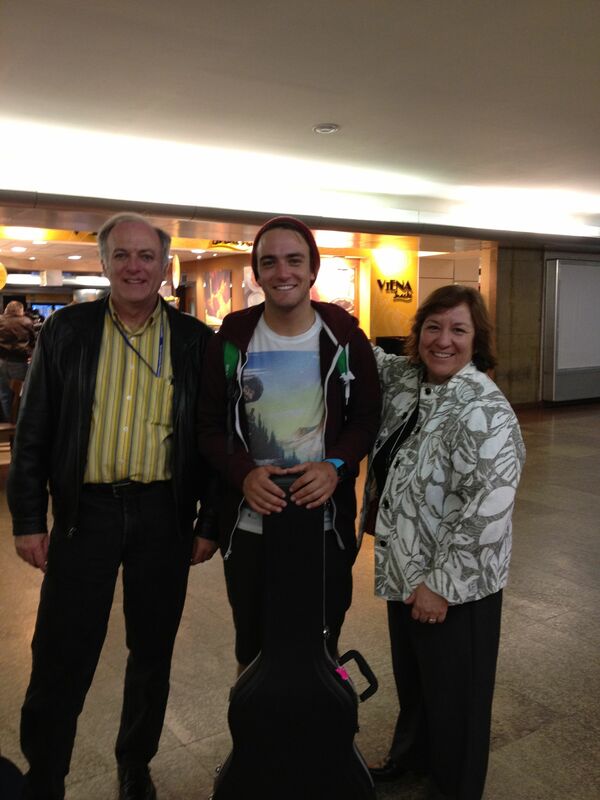 And now he’s here! 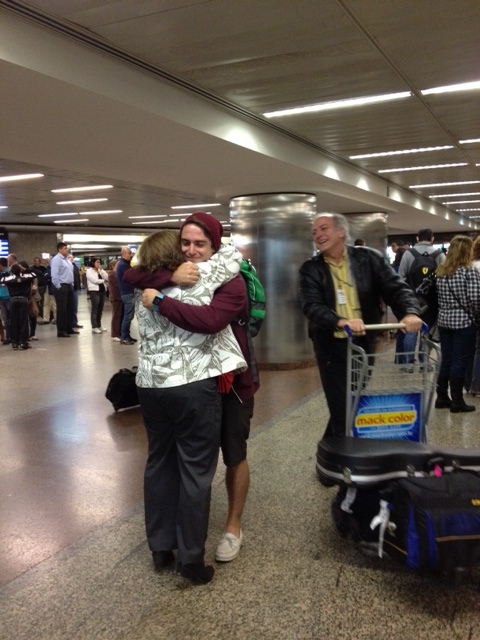 I cannot convey how wonderful it is to see him, hear him, and just be with him. We missed our boy. We wish Aubrey could have come too, but, unfortunately, that will have to wait until December. The house has already been filled with the sound of Scott’s guitar…which surprised and excited the pups, who didn’t remember it from their puppyhood, and who reacted by charging Scott and barking maniacally. Scott will be working at the Community Liaison Office this summer, helping to greet new arrivals, and answering any questions they might have. Talk about the blind leading the blind! Yesterday, he was introduced to the people with all of the answers, so he’ll be okay while his two bosses are out of town for two weeks, leaving him in charge. Oh Lord. Got word today that he might get to design and plan the community garden space that is being planned for the grounds…that could be fun and challenging for him. Meanwhile, he’s helping me to empty all the boxes that arrived last Friday. 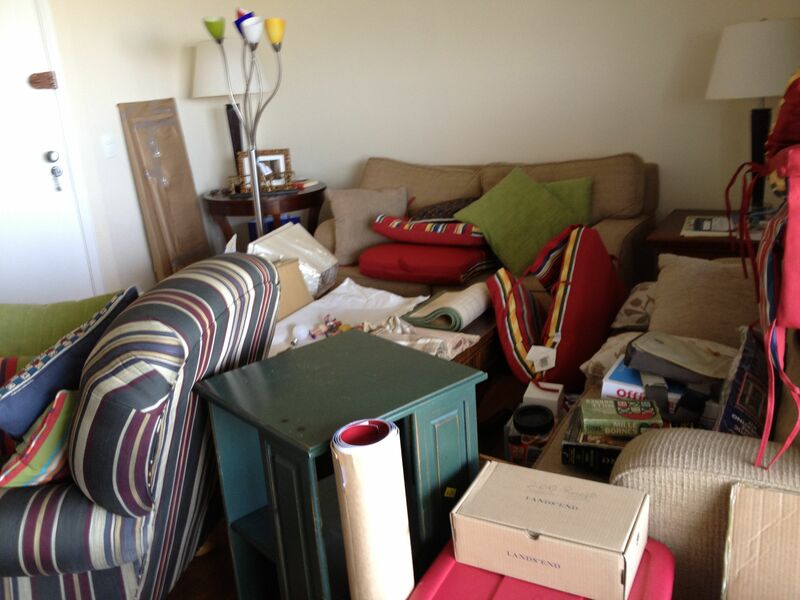 We got so much more of our belongings than we had expected, and I’m trying to find a place for it all. 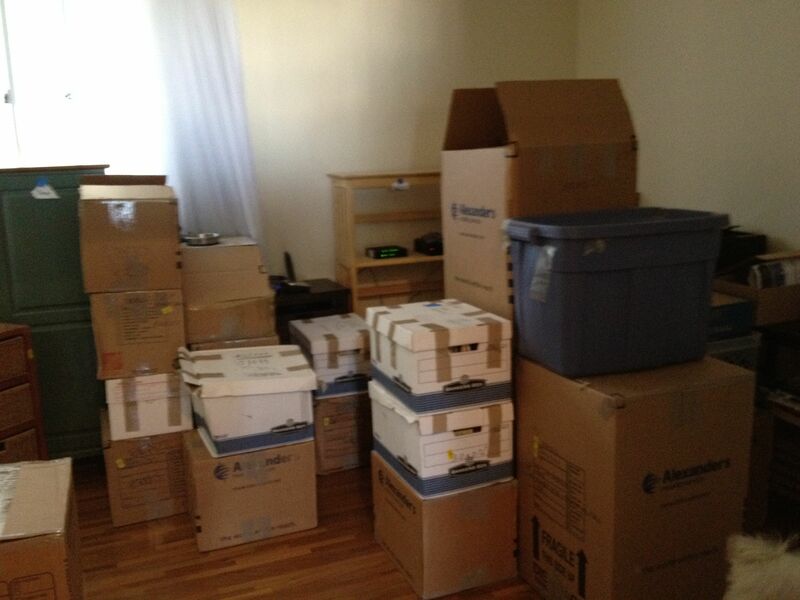 Moving from a house of 20 years to a condo is a bit of a challenge, logistically. 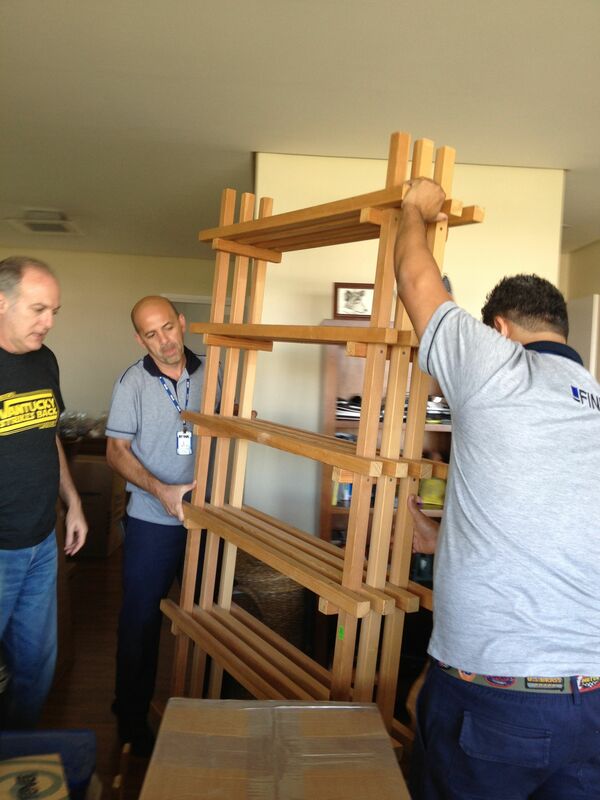 Tom put in a request for a dining room hutch, since all of our crystal and fragile knick-knacks arrived unexpectedly. Also in the crates: a bookshelf that Dad and I had built a few years ago. Turns out that many of my books also arrived, so it’s a good thing we have the shelving. About Scott and Aubrey’s childhood toys, I’m not so certain. Maybe Scott and his friend from the condo building next door can play Legos when they’re not out enjoying the night life! We didn’t have too much damage: a broken lamp, melted and warped charger plates (! ), a broken bathroom cupboard, water damage to the top of a cabinet, and a damaged statue were the worst. But after unwrapping all of our items, I can see why there was so little breakage. Every single item, no matter how small, was wrapped in a minimum of two sheets of butcher paper. Such waste! The movers tried to empty boxes for us, but we ran out of counter space and floor space, so they left us with about fifteen or twenty boxes to unpack ourselves. Amazingly, all we had to do was put the boxes and packing materials out in the hallway, and the trash crews hauled it off. I’m hoping one of our local pull-cart vendors was called for the treasure trove. I couldn’t help thinking that some of the sturdy boxes would make great quarters for the city’s homeless. Seriously. I’ll find places for everything, but it’ll just take a little time. 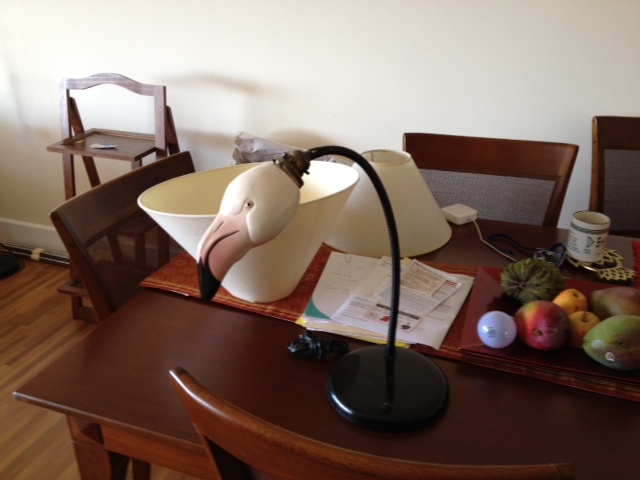 Meanwhile, what joy to look around and see our coisinhas, our little things that make a condo a home!…Scott and a flamingo lamp! Nice header photo, by the way. Thanks, Sharyn. As you can see, we were happy to be together. And yes, it was like Christmas…an overly generous Christmas, where the giving just never stopped! But so nice to have our lives with us again! Quite a contrast between the first photos and the neat stack of boxes. It must have been kind of like Christmas unpacking everything to see what was there.